Today on the train, I brought out the neuroses of a fellow passenger. Shocking, I know. Let me explain what happened. I'm always on my computer when commuting. I'm either surfing the web, working, or writing for TTIV. This morning was no different. I had to prepare for a meeting by typing notes. I wasn't in the quiet car, but mornings are typically silent unless some amateur commuter decides to have an in-depth conversation with his doctor about his gall bladder, or has an urgent trade to make. SELL! SELL! SELL IT ALL! WE'VE GOT TO GET INTO PORKBELLIES!!!!! This type of individual completes his call and then looks around to see who paid attention to him. You can't miss him, because he walks around with a neon sign anchored to his head that says, "Pay attention to me, for I am fascinating." Sorry, I'm deviating from topic. So much for my 2015 resolution to stop doing that. Over on the right is the first crude drawing of 2015, so you can visualize how we were seated. 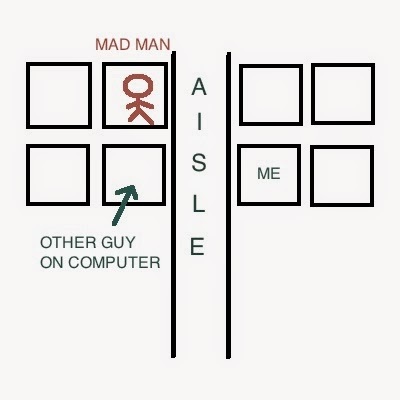 I'm in the aisle seat on the right, and on the other side of the aisle is another guy on his computer. He's typing as well. The guy in front of him is on the aisle, and he's not happy. He's angry. He's a MAD MAN. Every minute or so, he made a 90 degree head turn. He then made 180 degree head turns. He alternated between giving the other guy and me the evil eye. The other guy on the computer and I looked at each other, as if to say, "what's his problem?" I saw the MAD MAN become more agitated, and I prepared myself for him to confront me. I wasn't banging loudly on the keys, and he really needed to knock it off. I was going to have to defuse him if he became aggressive. At several points, it seemed like he was planning to say something, but it never came to a confrontation. He just sat there stewing, sighing heavily to himself. By the time we approached the East River tunnels, he packed up his stuff and left for the vestibule. The funny thing is, while his neurosis was unfounded and unreasonable, I fully get that someone typing on a keyboard sets him off on the commute. We all have things that push our buttons. His neuroses just differ from mine. I forgot to ask him if he has a blog. We could have cross-posted. I'm always looking for ways to grow readership. Opportunity lost.